The Rolling Stones frontman - famous for his hip-thrusting dancing - has admitted that at 69, he just can't move like he used to. Jagger revealed: "I just have to train a lot and keep really fit. I want to do these moves, but I can't do them because if I did, I'd probably s**** up. You just got to do what's within your capabilities. I don't want it to look wrong, so I'm going to stay within my boundaries." 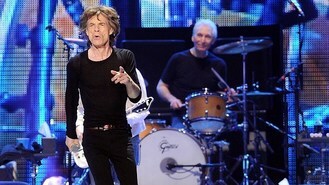 On their latest tour The Rolling Stones have at least three days break in between tour stops. Fans hope more dates will be added, but it could be that the time is needed for the band to rest. "I think it's a little bit of both," Keith Richards said. "The band wants to pace themselves, but at the same time... I guess what's been announced is the bare bones and we will play it by ear from there."